Home > News > Feeling a Little Insecure? We’ve been suggesting that you make the leap to https for your websites now for a couple of years. It started with a warning from Google about site security having an impact on search rankings. That was a compelling enough reason to make the upgrade. Google is now placing a NOT SECURE warning in red in their Chrome browser for unsecure sites (see image example below). Attracting and keeping website visitors is hard enough, you do not need a bright red browser warning telling potential customers your site might be harmful. In the first impression game, this is not a good first step. The not secure warning undermines customer trust and confidence. The time to make this upgrade is officially now. 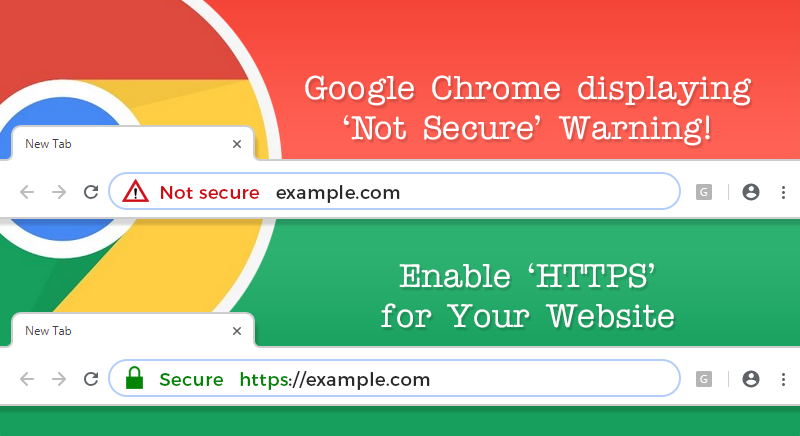 The good news is that enabling https for your website is relatively easy and affordable. There are three steps to getting secure. Purchase a secure server certificate from your website’s hosting company. They will install it for you. The purchase of the SSL certificate is done by you, the site owner. Install re-directs (301 Permanent Redirects) from the http version to the https version of your site so that when/if someone accesses the site from a legacy http-based link, it will automatically redirect to the secure site. This last step is critical both for accessibility but also for SEO purposes. This step is also best done by your web services provider. For some hosting accounts, the secure server certificate is actually included in the cost of hosting. If you are interested in this option, let us know and we’ll connect you with a local hosting company that includes this service in their hosting package. Even in this scenario, that only addresses step one in the three steps. You will still need your web services provider to finish out steps two and three for you. Site security was one of the four cited in our Is Your Site Ready for 2019? article at the New Year. Even if you are not ready for a full website redesign, this is an issue that needs to be updated as soon as possible. It is quick, easy and affordable. The cost (in trust, confidence, and rankings) for not making this upgrade far outweighs the fix.